Check Out these Awesome Books! The Trust Me? 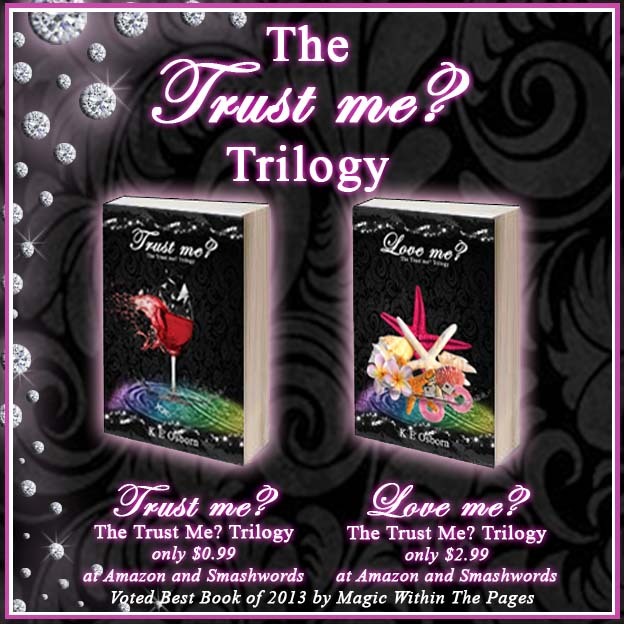 Trilogy by K E Osborn! Trust Me? The Trust Me? Trilogy by K E Osborn is now available for purchase for $0.99cents at Amazon, Smashwords, Barnes & Noble and Kobo. My nerves start to get the better of me, I start to feel nauseous; those darn pesky butterflies attack again. I’m not sure why I’m nervous, whether it’s the shoes making me unstable or whether it’s the memory of our first date, our first touch, or our first kiss that’s making me bashful. I turn the corner to see him standing there with a bunch of red roses, in the suit that he changed into earlier, this time with a baby pink tie on. Behind him is that gorgeous waterfall cascading down the cliff with the lush greenery surrounding us. As I take a step closer, I hear music playing. 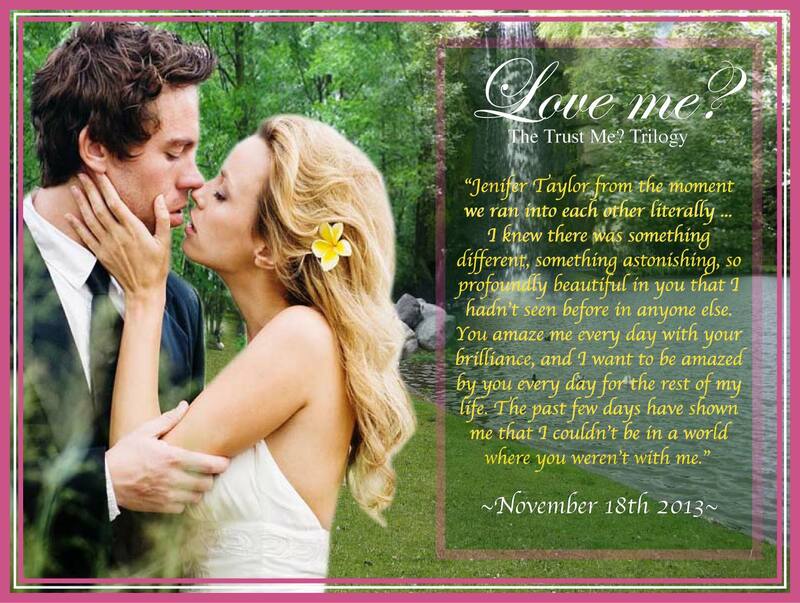 “Thank You for Loving Me” by Bon Jovi. It’s our song. I feel my eyes welling up as all the emotion and love I feel for this man is becoming too much to bear. His smile is beaming from ear to ear when I approach. Finally I reach him. He holds out his hand for me to take. I take it, and he pulls me into a tight embrace. “This is perfect,” I whisper. Love Me? The Trust Me? Trilogy by K E Osborn is now available for purchase for $2.99 at Amazon and Smashwords.